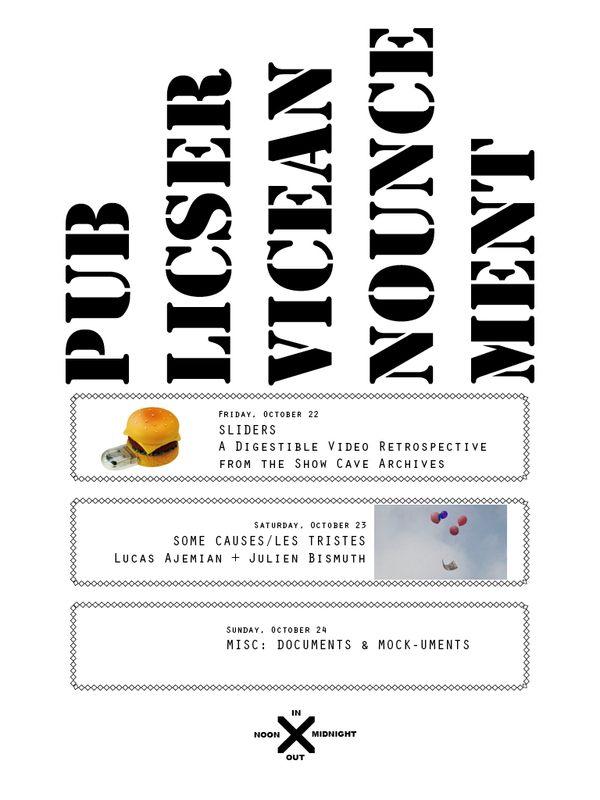 PUBLIC SERVICE ANNOUNCEMENT | Genesis Breyer P-Orridge, Eric Wareheim, Animal Charm, Aids 3-D, Hazel Hill McCarthy III, Kathleen Daniel, Tommyboy, Jules Marquis, Bobbi Woods, Eric Nordhauser, Steve OR Steven Read, Jon Clark, Dev01ded, Alejandro Garcia Contreras, Jacinto Astiazarán, Drew Blood, Mario Zoots, Abdi Taslimi, Actually Huizenga, Drone Dungeon, Doug Lussenhop, Santi Vernetti, Nathan Maxwell Cann, Nic Chancellor, Rich Bott, Jim Fetterley and Douglas J. McCarthy, Lucas Ajemian, Julien Bismuth, Viper/BANK TV, Joey Frank, Marie Losier, Ms&Mr and more. INVISIBLE-EXPORTS is pleased to present PUBLIC SERVICE ANNOUNCEMENT, a three-day video festival, featuring a new video program each day from noon through midnight. The programs will be viewable from both inside the gallery and outside on the street. SLIDERS is a 70 minute program of a selection from our ongoing video series. The selections come from past video shows which were curated by Hazel Hill McCarthy III for Show Cave including Permanent Vacation, Spread Eagle, Quartz Qube, Moon Illusion, Future Heat and Summer Sizzlers. Show Cave began this video series in 2008 asking artists to make new work that approached the titles of each show. Artists include Genesis Breyer P-Orridge, Eric Wareheim, Animal Charm, Aids 3-D, Hazel Hill McCarthy III, Kathleen Daniel, Tommyboy, Jules Marquis, Bobbi Woods, Eric Nordhauser, Steve OR Steven Read, Jon Clark, Dev01ded, Alejandro Garcia Contreras, Jacinto Astiazarán, Drew Blood, Mario Zoots, Abdi Taslimi, Actually Huizenga, Drone Dungeon, Doug Lussenhop, Santi Vernetti, Nathan Maxwell Cann, Nic Chancellor, Rich Bott, Jim Fetterley and Douglas J. McCarthy. Lucas Ajemian and Julien Bismuth have been a collaborative duo since 2005. Their work addresses the idea or ideal of authorship, the nature of work, the shape of communication and the contours and limits of creative activity. They have exhibited together at the Galerie Georges-Philippe & Nathalie Vallois, Paris (2008); Galerie Parisa Kind, Frankfurt (2006), the Orange County Museum, Newport Beach, CA (2008), Foxy Productions, New York (2008) and at Invisible-Exports (2010). Screening includes Some Causes (2008) and Les Tristes performances from 2007 – 2010. A program featuring creative documentary work, in which the story sometimes takes precedence to the truth. Featuring works by Viper/BANK TV, Joey Frank, Marie Losier, Ms&Mr and more.